Yasue Schumaker spoke to CNN last Saturday from inside a hospital in Sendai, Japan, where damage from the quake is extensive. 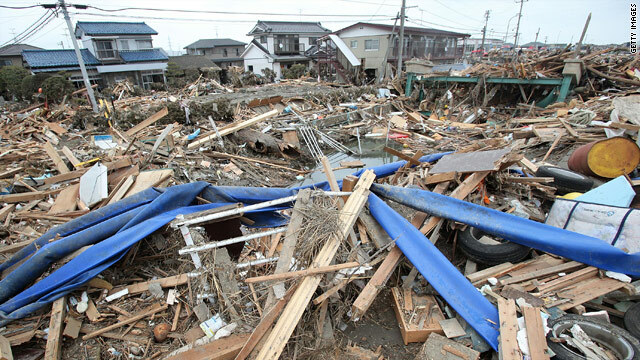 A survivor of last week's earthquake and tsunami in Japan who made a tearful plea for help on CNN is getting by on help from an extended network of friends and family. Yasue Schumaker was marooned in a hospital in Sendai with her mother when CNN interviewed her March 12. "We're in an emergency, please help us," said Schumaker, a resident of Hawaii who had returned to Sendai to help care for her ailing mother. "Somehow, we can hang in there, I hope. We don't have any electric, water, gas ... but please, help the people who lost their homes and the people on top of the buildings asking for help." Supplies from relief agencies and the government are still difficult to come by. But help is starting to trickle in from other sources. Yasue Schumaker's cousin, who works for a large company that is putting together and delivering relief packages, was able to get her four boxes of fresh fruit, and canned and packaged goods, her husband, Scott Schumaker, told CNN. In another instance, a reporter friend of her husband's who went to Sendai to cover the tragedy brought some sushi for her. It had gone bad by the time it arrived, but it's the thought that counts, said Scott Schumaker. Her meager provisions are sometimes shared with her mother and the three other patients in her room. "I believe that's how they'll get though this," he said. "They won't rely on government agencies or relief agencies. It'll be family helping each other, neighbor helping neighbor, companies helping employees." Five days after the quake hit, Yasue Schumaker was able to return to her childhood home, wrote Scott Schumaker, who is blogging about his wife's progress. They communicate through texts and e-mails and the occasional phone call, when reception permits. On Tuesday, she heard the road to her family home was clear. The 7-mile drive took a couple of hours, Scott Schumaker said. "To our surprise, the house was still standing and was structurally sound enough to enter," he wrote. "There were broken dishes everywhere and virtually every shelf was cleared. " The house also had electricity. "Her neighbors said it comes and goes as there are rolling blackouts," he wrote. "She spent the day cleaning and then gathered up her valuables – some food, money, passport, blankets, clean clothes. The food of course was the most important thing but fresh clothes were a close second. She’d been wearing the same thing since the quake hit 5 days earlier. She then returned to her mom in the hospital in Sendai City." ...I'm not sure I like the way this article is written. I really get a "Thank God I'm married to a affluent White man in America" tone from it, and not what the original issue was. I watched the news when this persons pleas originally aired, and you could hear how badly she wanted help for her people. But this comes off not as Her pleas for National help were heard so much as she got lucky her family got her supplies. i dont know if you read it right, it says her husbands cousin WORKS for a company making care packages and her husband knows a reporter that brought her a little bit of food. none of this says "Im married to a rich white guy"
You have issues and are looking for the negative aspect in this story. I think you need to look at your bias in life and understand it's roots. In that case, Marielle, white people get things done rather than waste time and loot. Is that what you read between the lines as well – a positive note perhaps with a bigoted twist? Naw, there's nothing but just a woman who got lucky to have a carring, non-self-serving family member who made it their mission to help their own family members. That's how it should be. You got more than I did. The article was a little scattered and confusing, though I think I got the gist of it. Having not seen the original pleas, I think I need to go find that article/video first for this to make sense. I think the article is fine. It told about her pleas to help the whole country, and focussed a little on her. It gave us a look into what life is like there. Many lost everything, some still have a house, everything cracked...good report. Hah, someone doesn't know how to cook. Sending "Sushi" across congested destruction paths at this time when military boots can't even get through? I think the wifes husband cousin reporter friend thing tells the story of the 1 that has a home left though not in good shape. Ok it has been a week. What help are we sending, is it getting to people before they die and disease sets in. We all know how the Haiti thing turned out or haven't we learned anything. Remember Bush wiping his hand on Clintons shirt. I just want the supplies to get there and be distributed. Katrina Haiti what the hell, how come we cannot get barrels of kerosene to them. Lets go. And whats the company that makes that food freeze dried in packages. I told Obama to hire me and I would handle this kind of tradgedies. I know we always send billions, but what does that do. I rather get organized and send help from near by countries and spend 1/2 of a billion. They can't move supplies because the infrastructure is completely destroyed. The only option is helicopters and those are in somewhat limited supply. Yelling DO SOMETHING won't change that fact. It's a lovely story of hope, and the unconventional ways that hope is being delivered. I think it shows how people are coping...by finding different ways to get the helo they need, and not waiting around and playing victim (which these peiple certainly ARE!) These folks have spirit. Godd for them! If this is an example of the majority of the mindset in Japan, they will pull through this! Sorry about the spelling; forgot to spellcheck! Oops! I can't believe as to the stupidity of someone sending sushi to a disaster-stricken area where thousands are dead and missing. Water, medicine, clean blankets perhaps, if really want to be of any help??? I can't believe this story makes it to CNN. People don't think (regarding sending sushi) Wasn't clear on just how devestated everything is....almost to non existence. Sushi. Oy. Someone brought her sushi? Where there is no electricity?! Smart. Don't people think about these things? Sounds to me like she wanted help from any place she could have gotten it. People are reading things into stories that aren't even there. These people just need help. Do what you can. If you find that you cannot do anything, at least do not complaine and be so negative.